Arjuna's flag (on his chariot) had a monkey (Hanuman) sitting atop. Krishna has a peacock. Duryodhana, Bheeshma, Drona, all had distinctive flags on their chariots. Why? Why do gods need flags, and that too distinctive, and distinct from each others? 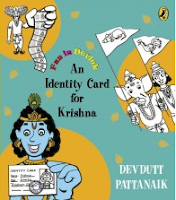 This short and fun read from Devdutt Pattanaik, mytholigist par-excellence, takes children on a brief journey into this history, set in today's modern times, where the blue-skinned god, Krishna, needs to produce identification to get through security at the airport, and is on his way to Assam to listen to the story of how gods were mandated by sage Chavana (Chyavana), husband of Sukanya, to have this form of identification. The wise sage wasn't too happy, I suppose, with the fact that the celestial twins, the Ashwini brothers, probably had designs on the sage's wife, Sukanya. But that is, another read! 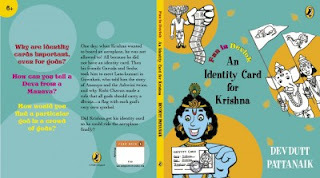 The book is a short and enjoyable read, but perhaps could have been a little longer, and introduced children to some more philosophical concepts.